We’re in close contact with a little human who is exploring his world. His hands are grabbing and pulling, smacking and shoving. Who is this, you ask? But this Value of Gentleness is a necessary reminder for spouses also! Be gentle with your spouse! Being gentle with your spouse is more than a physical thing. Gentleness also shows up in how you respond and interact. This is important for husbands and wives. 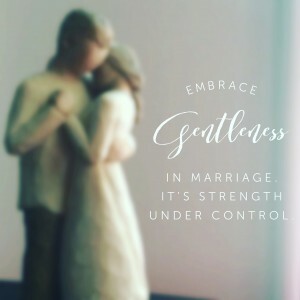 Here are 10 ways I’m challenging you to be gentle with your spouse. 1 – Use self-control: address difficult issues at a good time for your spouse. Gentleness chooses to address difficult issues at the best time – often during the day instead of at night. Be a student of your spouse – I’m guessing you know full well when he/she will be able to discuss and solve issues better than others. Control yourself. Wait. Gentleness is strength under control. Gentleness is strength under control. 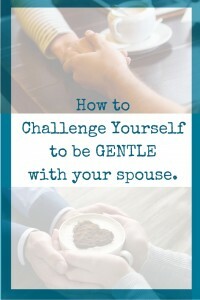 Challenge yourself to be gentle with your spouse. 2 – Honor your spouse’s free will. Gentleness honors the free will of your spouse, but does not join in agreement just to placate. You don’t need loud words every time you disagree with your spouse. Heated words aren’t necessary, nor do you need to default to agreement. Your spouse is intelligent. Seek to understand even if you don’t agree. Gentleness is honorable. Gentleness is honorable. Challenge yourself to be gentle with your spouse. 3 – Respect shines through – especially – when speaking the truth on tender issues. Gentleness speaks the truth in love and as it shines a light on a tender issue, gentleness maintains respect and kindness. You can still be truthful when addressing those delicate topics. But be gentle by using love and respect as you do. Gentleness moves with respect. Gentleness moves with respect. 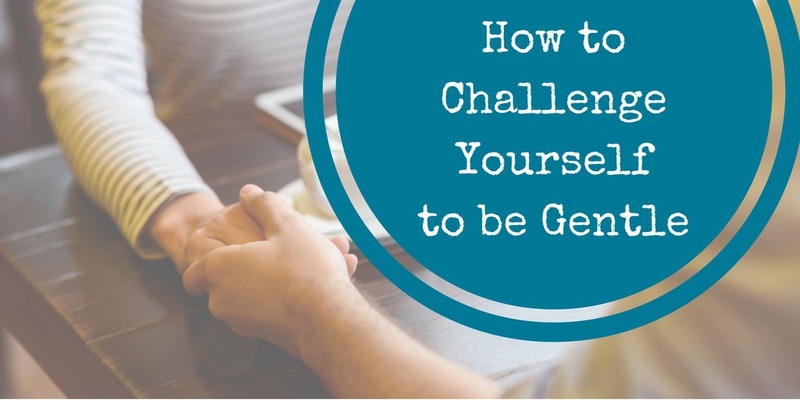 Challenge yourself to be gentle with your spouse. 4 – Lead with an even-temper in a crisis – remaining diligent. Gentleness remains even-tempered during a crisis, yet stays alert for possible dangers. Work to keep your tone and pace deliberate in a crisis. Your spouse needs you as a reliable team-mate when dealing with the hurricanes and tsunamis of life. Keep your head up and in the game, but don’t over-react when facing challenges. Gentleness reacts in a positive and reliable manner. Gentleness reacts in a positive and reliable manner – challenge yourself . 5 – Hugs are valuable. Commentary is not. Gentleness offers a hug when your spouse messes up, and says nothing. Your spouse knows where he/she messed up – there’s no need for your commentary on the issue. There’s no need to belabor the topic. There’s no need for an analysis or debrief. Here’s where being gentle means not saying anything (unless asked – and then still be gentle – see above note about respect). Gentleness knows when to be quiet. Gentleness knows when to be quiet. Challenge yourself to be gentle with your spouse. 6 – Humor can be the best medicine. Sometimes. Gentleness uses light humor to diffuse tense moments. 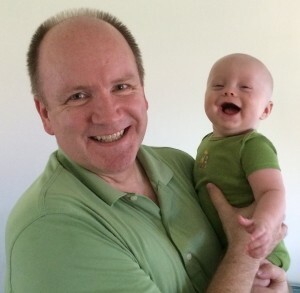 Does your spouse respond well when you’re trying to be funny? If so, then absolutely carry on… Lori asked the orchestrator of a blogging conference how her husband contributed in a positive manner to her business – Mellisa Llado said, “He makes me laugh when I’m stressed.” If you know how to do that for your spouse, then you’re ahead of the game! If you haven’t mastered the concept of light humor… try. Get your spouse to help you. Gentleness brings a smile even in a tense moment. 7 – Cover and protect your spouse’s tender spots. Gentleness protects vulnerable spots but addresses the hurt that needs healing. Sometimes a hurt needs a chance to breathe – to be explored within a trusted relationship. Can your spouse trust you to be gentle with his/her hurts? Can she/he trust that you won’t poke or prod or expose a hurt in an unfriendly atmosphere? Prayer is a wonderful way to cover and protect your spouse’s tender spots. (Just sayin’) Gentleness is trustworthy. Gentleness is trustworthy. Challenge yourself to be gentle with your spouse. 8 – Remain deliberate and inclusive. Gentleness never needs to yell, and never cowers or whimpers. You don’t need to be autocratic, nor do you need to be deferential. It’s not an either/or situation. Marriage is a team sport where you use your strengths to enhance each other’s life. Yelling is not a strength. Neither is passivity. Avoid either end of the spectrum and include your spouse’s strengths with yours… deliberately. Gentleness is comprehensive. Gentleness is comprehensive. Challenge yourself to be gentle wth your spouse. 9 – Ask Questions. Live Grace. Always. Gentleness takes its time to consider all the facts, but is quick to forgive and ask for forgiveness. Study the life of Jesus. When challenged He often responded with a question. He didn’t judge, rather extended grace. His strength and stamina are indisputable, yet Jesus would be the first example of Gentleness I’d use. Exercise your ability to ask for and extend forgiveness. (We recommend the book by Gary Chapman and Jennifer Thomas on this topic.) Gentleness approaches conflict with grace. Gentleness approaches conflict with grace. Challenge yourself. 10 – Gentleness is unspoken, yet evident. True gentleness is strength under control. Challenge yourself to be gentle with your spouse. Don’t think this Value is good just for husbands toward their wife… These ten aspects of gentleness are as true for one as they are for the other. As a husband, I know that I appreciate the value of gentleness in our marriage as much as Lori does. Husbands and wives: Be gentle with each other! Your life together is precious. *This post is skating closely on the line where abuse might be found. Sometimes wives and husbands (yes, husbands!) are in abusive and violent relationships with their spouse. Abusive in word and deed. If you are being belittled, yelled at, cursed, or hit, shoved, pulled, or pushed you need to seek help now. Abuse is about power and control – not of oneself, but of someone else. If you don’t feel safe in your relationship – reach out and connect with The National Domestic Hotline at http://www.thehotline.org — and if your internet usage is being monitored, then call 1-800-799-SAFE (7233), — help is available 24/7. Don’t wait. Consider the action of reaching out for help as your first step toward being gentle with yourself.